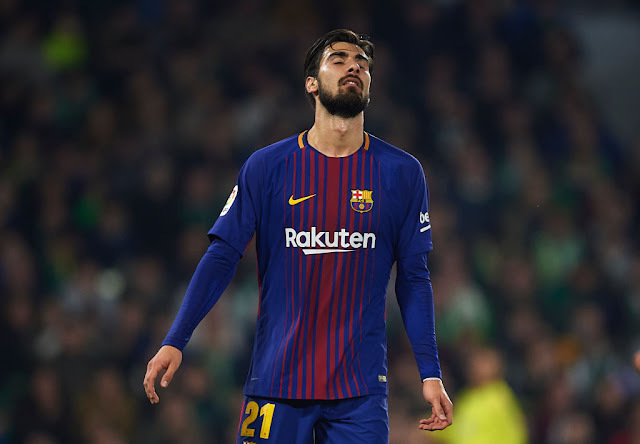 new Arsenal boss Unai Emery is very keen to bring Barcelona midfielder Andre Gomes to the Emirates. Gomes is said to cost around £30 million and Emery is willing to sell some players to fund a move for the Portuguese midfielder. Gomes arrived at Camp Nou in 2016 from fellow La Liga side Valencia for a fee of around £33.3 million. However, after spending two seasons at Barcelona, Gomes has failed to impress. The centre midfielder has made 78 appearances for the Catalan side but he has only scored three and assisted four in that time. While Gomes’s lack of goals may be excused due to him being a centre mid, the fact he has managed just four assists for Barcelona is simply not good enough. Especially when Gomes has the likes of Lionel Messi and Luis Suarez in front of him. On the other hand, Gomes has shown from his time at Valencia what a top midfielder he can be and perhaps all is needed is a change of club. Arsenal’s central midfield has had its problems for some years now. England and Arsenal’s Jack Wilshere was often sidelined through injury meaning Arsenal were often a man short in their midfield anyway and now Wilshere has officially left Arsenal they are in need of a replacement. Furthermore, Granit Xhaka, who signed for Arsenal for around £35 million, has proven to be somewhat of a flop. Gomes could very well be the man to strengthen what is, at the moment, an average Arsenal midfield.